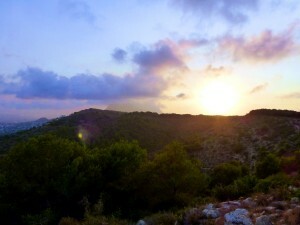 The morning sun is shining over Jávea. A slight breeze from the Mediterranean. 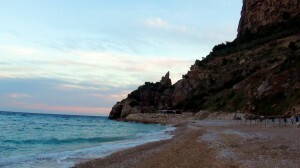 The first skinny dippers are sticking their feet in the warm shallow waters in the Javea bay. 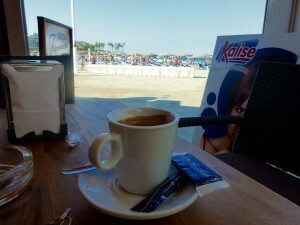 Time for a bit of breakfast and relaxation on the beach…. 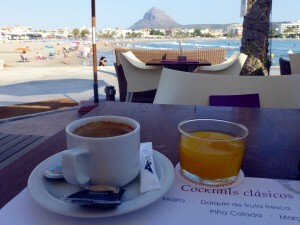 Fresh squeezed orange juice, boiling hot coffee brewed to perfection, maybe a bocadillo or a full English breakfast ? Never forget to enjoy the little things as well during your holiday breaks in Jávea. 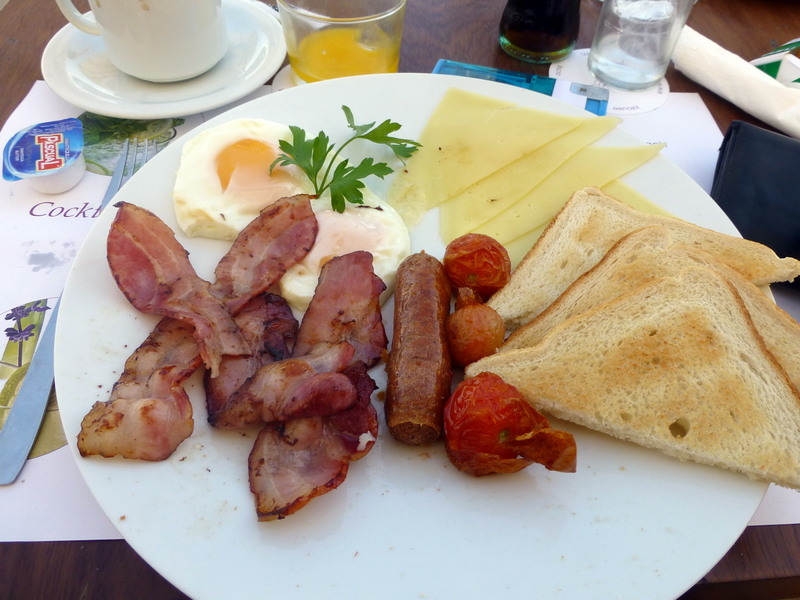 So if you desire a full English breakfast you would for instance say: Desayunos Ingles con café americano, por favor … but of course, on the Arenal Beach speaking basic English at the very least is the standard for all waitresses, if you dont dare to venture into Spanish. 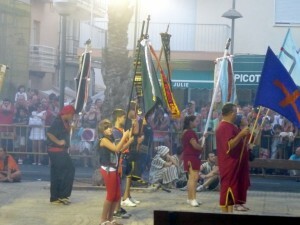 Bull running is an intrinsic part of the Sant Joan celebrations in Jávea, and is considered ‘controversial’ by most foreigners and ex-pats. As a vegetarian and lifelong animal rights activist I feel this is based upon a misunderstanding, and is unhelpful insofar as it distracts from, and causes local hostility toward, opposition of the very real issue of bull fighting. 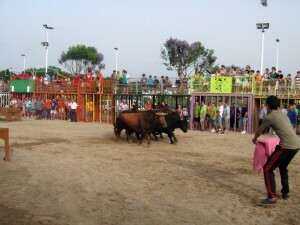 In towns like Jávea where there is no bullring, bull running has no connection with fighting, and IMHO is substantially less dangerous or stressful for the bull than most other sports involving animals, let alone intensive farming techniques, so I have presented here what actually happens in the hope of educating people around the world regarding the differences. 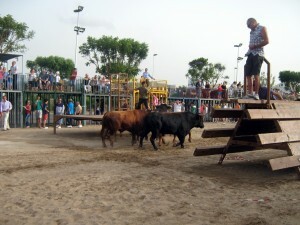 The event has more in common with an American rodeo, but without the more stressful/dangerous (for the bull) aspects, such as roping, riding and bulldogging. 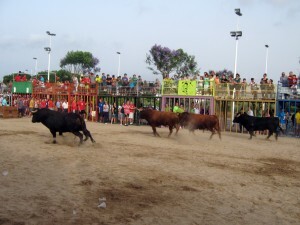 The bull events during Sant Joan in Jávea involve local ranchers showcasing their prize bulls, and the intent is for local men to prove their bravery (or insanity) by facing down the beast, with no intent to hurt or injure it. Indeed for most of the time the bull is very much in control of the situation, and happily follows the herd leader back to the compound when the next rancher has his turn. I am reliably assured that some of the guys carry rings in their hands, the idea being to try to get them on the bull’s horns, but I have never seen anyone get even close to achieving this. I’m not particularly presenting the event as a great thing here – if anything I find it pretty dull – but as you will see in this video the greatest stress any of the bulls had to deal with was being showered with party foam (which it didn’t even seem to notice) and having sticks and t-shirts vaguely waved at it. The biggest problem seems to be the bull losing interest and wandering off, ignoring the people. Guest post & video by Magick Temple. A holiday is all about relaxing, having fun and recharging the batteries, but should you fall ill or have an accident during your vacation in Jávea competent services are ready to help at all levels. An indefinite strike has been announced by the pharmacies on the Costa Blanca (The strike has apparently been called off and all pharmacies in Jávea should be open as normal … fear not if the conflict reignites, a pharmacy in Jávea will always be open for your medical needs. 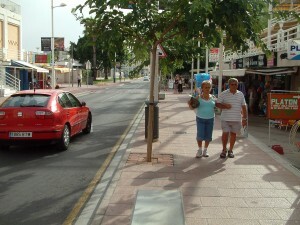 The open pharmacy in Jávea / Xàbia is found at Plaza l’Esglesia, 11. You find it by the main Jávea church, Sant Bertolome. Parking is available round the market and church square. If you need prescription drugs during your stay, ask your doctor at home to ensure you have the right kind of prescription. If you experience a medical emergency during your holidays in Spain, phone 112 for immediate attention from the Spanish health service. 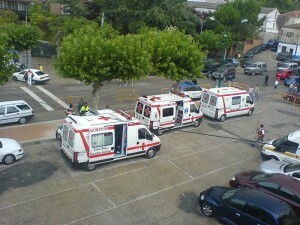 In cases where you need emergency help but have the ability to transport yourself to the hospital, there is a 24hour emergency service in Jávea old town on Plaza Del Constitution. Drive up to old town past the postoffice, turn right at the first option signposted towards parking. You can park in the underground car park under the plaza or follow the road round the square to go straight to the emergency. The emergency itself has big clear signs up, you can walk in 24/7 and be attended as appropriate by a qualified doctor or sent onwards to a hospital if need be. Bring your national health insurance card from home or documentation for your travel health insurance. The emergency service will treat you regardless, but failing to provide insurance documents means they will charge you. English or German Speaking Doctors? The Spanish health service is ranked among the best in Europe – and performs better than for instance the UK NHS in international studies of the quality of healthcare systems. As such you are in no way putting yourself in danger by utilizing the Spanish medical experts at your service. However, if you prefer a guaranteed English or German speaking doctor, there are plenty of options in the Jávea area. In cases of emergencies you can phone the local 24hr medical emergency hotline and get advice in English/German, the number is 648 779 659. The emergency hotline can arrange for a doctor to provide a home visit, refer you on or simply give advice. But remember, these English and German doctors are private and not covered by your national health insurance or any travel insurance you have taken out. The services provided are pay as you go with basic consultations in their medical facilities during normal opening hours starting at about 35euros. 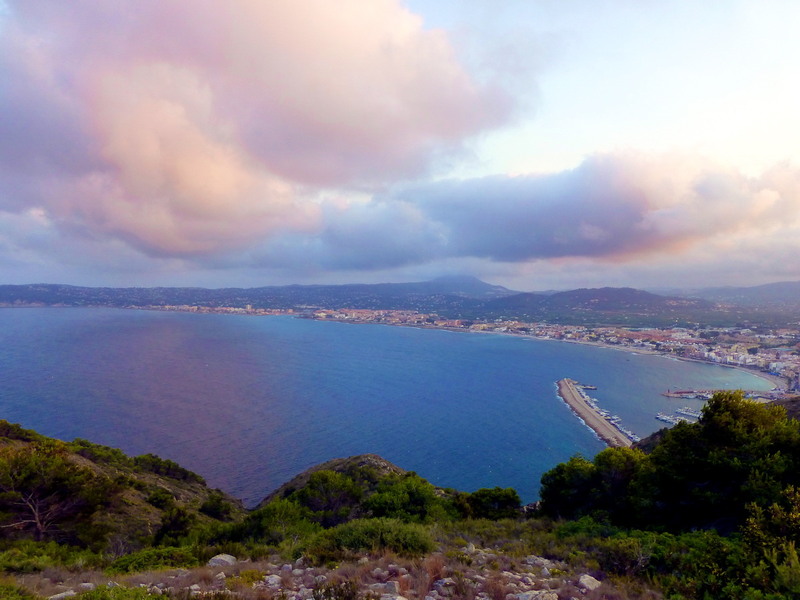 A highly skilled and easily found private English speaking doctor is found at the main roundabout into Jávea towards Cabo De La Nao – the Euro Clinic on Carretera Del Pla 138. They are open from 9am till 1pm and from 4pm till 7pm. You can walk in or phone for an appointment at 96 646 39 12. But the Moors are ready to defend the city at all cost…. Uh oh, Christian girls with guns! They use real gunpowder and each shot thunders through the air. The burning gunpowder fills the air with smoke and residue. 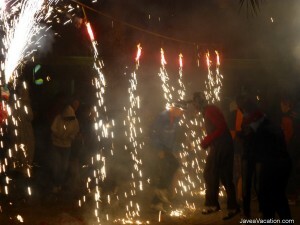 ….after a parade of the Javea Muslim moors retreating and the victorious Christians of Jávea marching the streets in triumpf … it was time for the demons to transform the rest of the night into a havoc of fireworks fired at the crowds, correcfocs! Dont forget. The final day of Moors and Christians remains. Dont miss it. 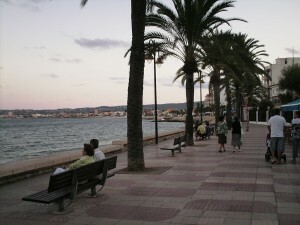 Jávea Port – get there late afternoon for parades and fireworks! 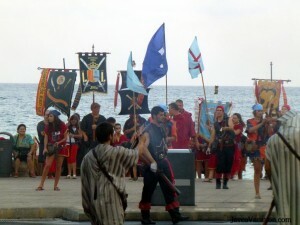 The final battles between the Moors and Christians in Jávea 2012 are ready to be fought this Saturday and Sunday evening. If you fancy experiencing some of the most visually spectacular fiestas in Spain, the Moors and Christians final weekend is the place to go. 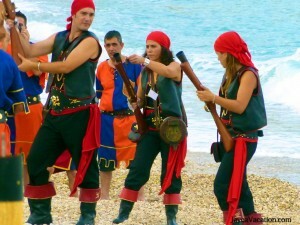 Saturday evening on the Jávea port features stunning enactment of the grand battles as the Christians launched an offensive to drive the invading Moors back out to sea. You can enjoy the spectacle through the night by simply heading to the port and following the action, chilling out in the many promenade bars with tapas and refreshments. The Saturday nights events at Moors and Christians ends with Correfocs, a mad fireworks chase in the streets, and disco till the early hours of Sunday morning. 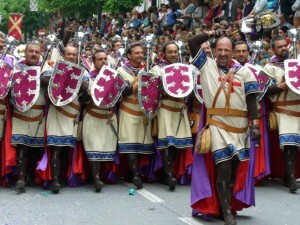 The grand finale of Moors and Christians 2012 in Xábia is reached with a parade of all participants in full traditional gear. The parade is followed by a Fireworks At Sea display that shouldn’t be missed. 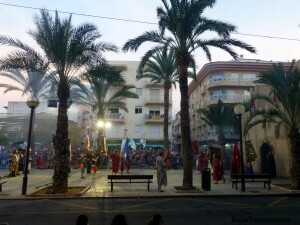 It is entirely free to attend all the events of the Moors and Christians, they take place on the Jávea port and the interesting parts start as the sun sets behind Móntgo. Leaving you plenty of time to head there early evening for the Medieval market and dinner before the shows start. Vamos a la playa! The summer sun is burning over the Costa Blanca and the clean blue water of the Mediterranean licks the coastal line of Jávea with its plentiful charming beaches and tempting little coves by the sea. 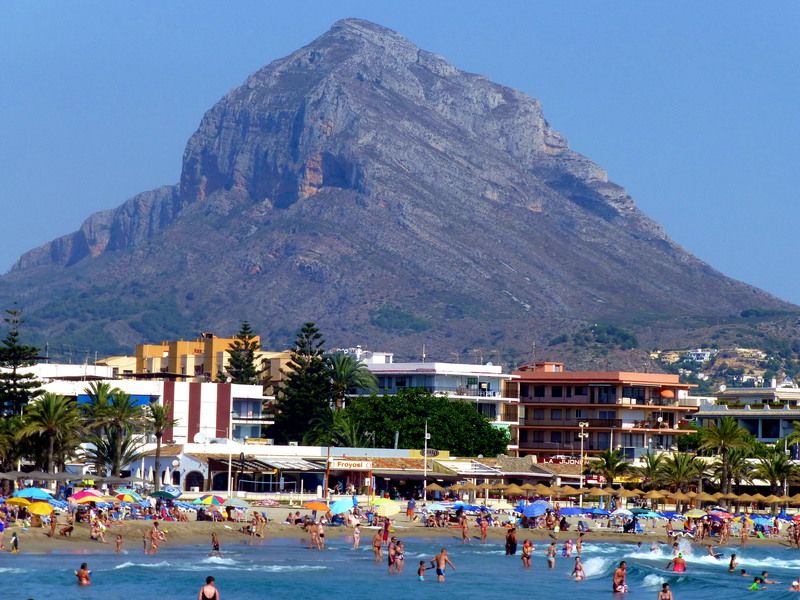 A few kilometers south of the main Jávea beach, Playa el Arenal, in the popular tourist area of Cumbre Del Sol we find one of the most eye catching beaches of the area – Playa El Moraig. The pebble and sand beach of El Moraig is surrounded by impressive rocks and cliffs on all sides. The El Moraig beach features all necessary facilities such as a beach bar and sea view restaurant, easy parking and Red Cross lifeguard service. However, the truly spectacular characteristics of the Benitachell beach of El Moraig are the beauty of the cove and the limestone coastline transformed over centuries by the Mediterranean waters to peculiar geological formations and caves. Speaking of caves, snorkling and scuba diving at El Moraig is ideal due to the clean waters and interesting shapes at the bottom of the sea. But further El Moraig holds the Cova Del Arcs which constitutes the entry to and beginning of the El Moraig underwater route. A spot to explore for cave divers at all levels of expertise. 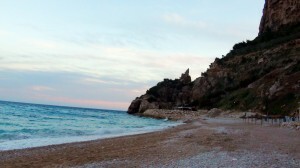 Holiday rentals are available near El Moraig beach at the Cumbre Del Sol urbanization, which is also the place to go to find the beach if you simply fancy a picnic in jaw dropping surroundings whilst in vacation accommodation elsewhere in the Jávea area. 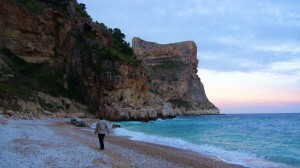 See more about the Spanish Beaches of Jávea or have a look at the Pictures from Javea to explore further on your own. The Xábia area is literally packed with small hidden coves and charming beaches surrounded by the iconic natural beauty of the Northern Costa Blanca. Have a hippie inside? Want to get those henna colored dresses out of the closet? Thursday evenings all through July and August the spirit of 69 flows freely across Montgo. 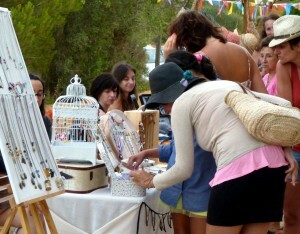 Hippie Market from 7pm every Thursday at La Hacienda on Montgo. Back in the 60´s a hippie camp was active on Montgo. The joints have long since been put out, but the club La Hacienda has brought back the flower power vibes with a weekly evening of hippie peace, love and understanding. The main feature of the La Hacienda hippie market is the selection of interesting stalls with hippie clothing, henna tattoos, restored furniture, Indian art, shirts and accessories completely handcrafted by artisans, classic vinyl albums and much more. 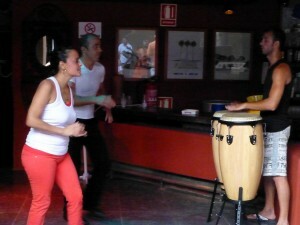 But you´re also in for an evening of flamenco, exotic dance and percussion at the atmospheric club of La Hacienda Denia / Javea. La Hacienda has a unique layout with several little bars and corners to enjoy refreshments and the mini pizzas etc on sale at the hippie market. Have a dance to the samba vibes or enjoy the enthusiastic flamenco and percussion performances as night falls over Montgo. The Hippie Market and La Hacienda are easily found on the top of Montgo. From Jávea follow the signs towards Cabo Sant Antoni and Denia up to the roundabout above old town. 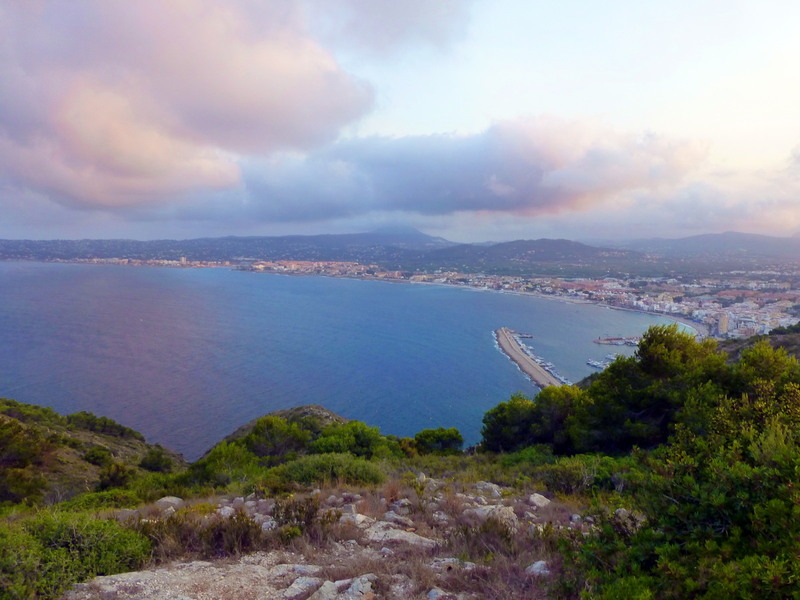 Follow the mountain road up Montgo and take a turn right when you see the signpost towards Cabo Sant Antoni. 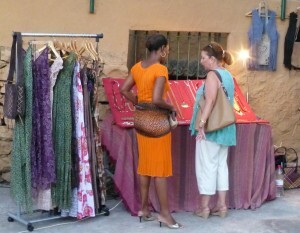 The hippie market starts at 7pm but heading up to Montgo early can be a great pleasure. 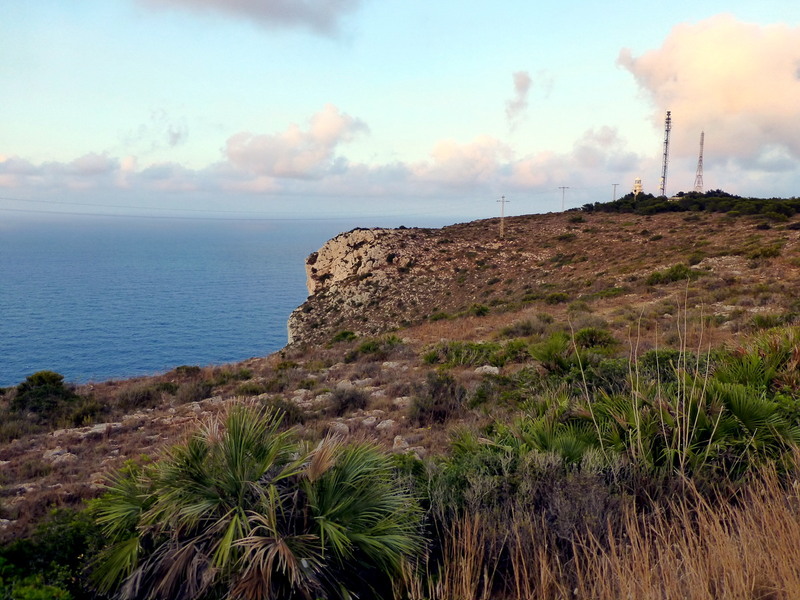 Try having a walk round the monastery, the old windmills or venture out to the Cabo Sant Antoni lighthouse to experience the spectacular views and maybe catch a glimpse of Ibiza. Moving To Spain – A New Livelihood ? Plotting a new life in Spain? Jávea is still tempting potential Spanish expats with glorious beaches, laid back Spanish culture and plenty of warm sunshine all year round. 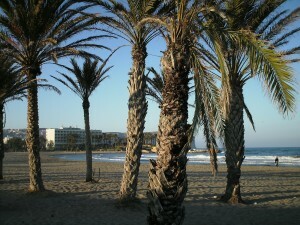 However, there are a few new potential obstacles to be aware of when considering making the big move abroad to Spain. The law wont have any implication on your opportunities to settle in Spain if you have a job, start a business in Spain or retire to the Costa Blanca shores with your pension, but it is a reminder to plan your new life carefully in advance. The Spanish government has introduced new rules for EU-citizens wanting to fulfill their dreams of moving to Spain. Do not be intimidated, in most cases these new rules wont interfere with your plans for a new life in the Spanish sunshine at all. You just need to be aware of them. Non-workers may have a pension, money in the bank or otherwise have enough assets to be able to support themselves and their family. The new law (Spanish Order 1490 of 9 July 2012) has been put into place to ensure Spain isnt burdened by people moving to the country without any way of supporting themselves. It may seem a bit harsh, but basically it all just means you cant move to Spain and go straight on benefits or other forms of social support – the country simply cant afford it. Moving to Spain has not as such become more difficult with the new laws, but they do underline the fact that living in the sunshine isnt just one long holiday – unless you bring enough funds to take the rest of your life off. You need ways of supporting yourself and your family. If you have money in the bank, huge assets or bring a pension with you, that is obviously cared for in advance. However, if you are reliant on finding a job to support your family whilst living in Spain, it is definitely something that needs careful research and planning. At the moment regular full time jobs are not impossible to find in Jávea or indeed on the Costa Blanca as a whole, but in general they are few and far between, often in the tourist sector, sporting fairly long hours and low pay. 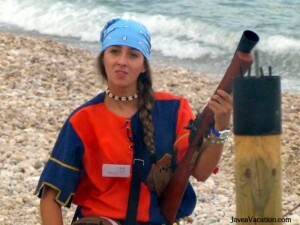 The typical jobs becoming available in Jávea are bar jobs, restaurant gigs as chef or waitress or various sales jobs. The odd office job, secretary position or admin type work pops up but its rare. Most service jobs require at least conversational Spanish along with English – other languages on top of that being a big plus as the local tourism industry in Jávea caters to Germans, Dutch, Scandinavians, Russians and many others as well. Finding a job in Jávea can be difficult, but in principle you have 3 months to do so before needing to apply for residency in Spain. It is highly recommended however that you secure a job prior to uprooting permanently and moving to Jávea. Taking a trip to Jávea for a week or two as a working holiday handing out your CV, looking for businesses hiring and talking to potential employers is a potential way forward. 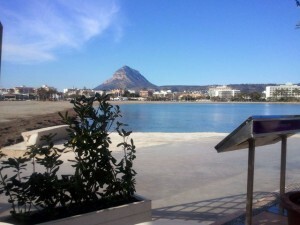 Another option is to research on facebook by joining groups such as “Javea Connect“, “Costa Blanca Jobs” and “Dream Job Directory Spain“. Another option is to create your own stream of income in Spain by starting a business. The easiest thing is to register as an autonomo, a self employed kind of registration, and set up based on that. If you have any useful trade or skills that obviously makes it a lot easier. A carpenter, plumber, electrician, hairdresser, healer, mechanic or similar can probably set up shop and tab into the expat market even without the language skills required for a job – but do your research in advance, some areas will be overcrowded with businesses of a certain profession and lacking others. If you have no skills theres still options to be creative and start a new type of business. In Jávea we have seen nice new initiatives open up such as an electric cigarette distribution business, a fish spa, various internet ventures, kayak rentals on the beach and many more. Again it takes planning, researching and funding but it is possible. Finally, several autonomos in Javea make a living running bars, cleaning or doing gardening – the competition is most likely cut throat and do not expect the millions to roll in anytime soon but with the right setup it might be enough to support you. Move To Spain – You Wont Regret It! 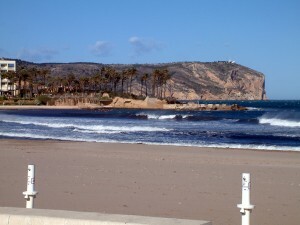 Despite the obstacles moving to Spain is still a wonderful choice for you and your family. The Spanish lifestyle, the charming villages, the funny fiestas and the lovely beaches – you are bound to get a smile on your face even in hard times. Just make sure you keep an eye on the new laws for immigrating to Spain and not least: Have a clear plan for your future sustainable livelihood once you get here. Jávea and the surrounding areas still has plenty of opportunities to be explored but it may take a bit more digging than it used to during the boom years. 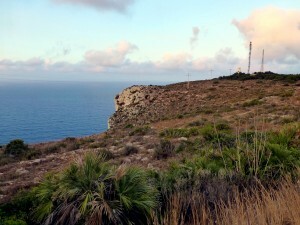 Supermarkets in Jávea – Missing Home? If you are self catering in your holiday accommodation in Javea, you are probably on the lookout for places to do some proper shopping for refreshments, food and meat for the BBQ. 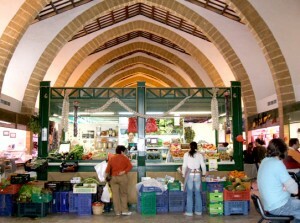 Jávea has a healthy mixture of supermarkets with different features and prices. You will most likely find one that suits you. Craving that cottage pie, English sausages or maybe a few Scottish eggs? Plenty of Supermarkets and stores are catering specifically to British expats and tourists. The main English supermarket in Jávea is Iceland. The chain store by Overseas.es is an expansion upon the Iceland stores you may know from England in so far as the Spanish versions are carrying a full range of stock with the non-frozen articles taking up more than half the floor space. Iceland in Jávea is expensive and having primarily imported foods on offer you wont get the blessings of fresh food and Spanish specialties in there. You will however be treated to all the brands you are used to from England. Iceland is found right in the middle between the Port, the old town and the Arenal – just take a drive down the main road connecting the 3 parts of town. Whilst Iceland is by far the biggest English supermarket in Jávea there are several smaller ones equally featuring imported brands from the UK and Northern Europe. One of the best ones is Keith & Lynns on the road up towards Cabo De La Nao, which features homemade bread and cakes, a secondhand book exchange of English books etc. In general, you pay extra for imported brands in the English stores, but if your Spanish is limited or you have special needs to cater for, the options are plentiful and if used to Northern European prices you wont be shocked by the final bill. Jávea has a rather large German population of expats and they are well catered for with no less than 3 dedicated supermarkets. The 2 German discount Supermarket chains Liedl and Aldi both have stores in Jávea featuring more or less exactly the same stock as is carried all over Europe by them. The prices are competitive even in comparison with the cheapest Spanish supermarkets. Whilst Liedl and Aldi in Javea both have German origins and plenty of stock targeted at Germans, their cross-European focus means you can easily go in there and pick up British brands too at a very affordable price. The third German supermarket is more of a specialty store called Aleman, located by Jávea Park. The shop is fairly tiny but full to the brim with German food such as curry heerings, remoulade, salty liquorice and brown flat-bread. Obviously, given the similarity in taste between Germany and Scandinavia, tourists from Denmark, Sweden or Norway will most likely find plenty of items from home as well. In the more specialised end of the market theres a small but well stocked Balkan supermarket on the main road from the Javea port to the historic center. The Bulgarian/Romanian supermarket carries a wide range of Eastern European specialties at quite reasonable prices. You are on holiday in Spain. Why not try some of the specialties the Spanish supermarkets have to offer? Ranging from giant hams over spicy sauces to fresh baked bread. Supermercadona is the big mainstream supermarket with a huge and varied stock. They are not the cheapest but they carry largely anything the heart desires. 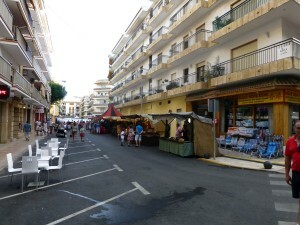 You can find Supermercadona just below Javea old town by the big car park and on the main road leading to the Arenal. The Mas Y Mas shops you see scattered all over the place are simply the kiosk versions of Supermercadona from the same company. Mas Y Mas has less of a choice on the shelves, the prices are higher and the shops are smaller – but they serve their purpose as little convenience stores that will usually be within walking distance. For more specialized Spanish food shopping you can venture into Supercor, which is rather expensive but has loads of extra delicious things on the shelves. 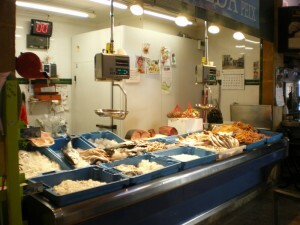 Another option of course is the indoor market in Javea old town, whilst not a supermarket you can do most of your food shopping there and get a real treat of fresh fish, meat, vegetables and bread directly from the producers round Xábia.